Suddenly being able to meet a lot of people who are open to being friends with you and having you in their social group. 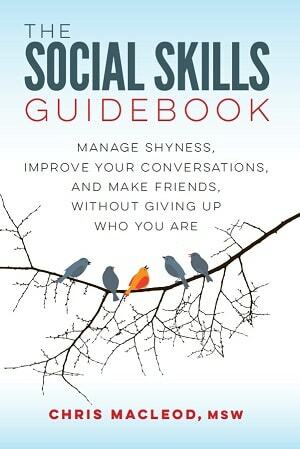 Meeting solid, likable people who you can learn better social skills from, either from observation and osmosis, or them more actively taking you under their wing. Having the opportunity to learn skills and knowledge that will make you more interesting and enjoyable to have around. Being able to do something that improves your self-confidence. Sometimes when you make changes to yourself they're not noticeable right away and build up under the surface until the right circumstances cause them to appear all at once - Being in a situation that provides those conditions. Here are some life factors that can make your social progress leap forward. Seeking out these opportunities can do a lot to help you. Making good lifestyle choices plays just as important a role in getting your social act together as working on internal things like your belief systems. Joining a club or team can sometimes give you an instant group of solid friends. There's also the comradery and common ground factors working in your favor. You may also get a boost to your overall reputation and status. The right hobby can allow you to meet people more easily. It could even quickly get you into a new social group. Certain hobbies have a certain amount of social cachet as well, so taking part in them can make you look a little better in some people's eyes. The classic example is learning to play an instrument and then joining a band. Meet individual co-workers who you hit it off with. Fall in with a whole group of co-workers. Be around personable or interesting co-workers who you can pick up social pointers from. 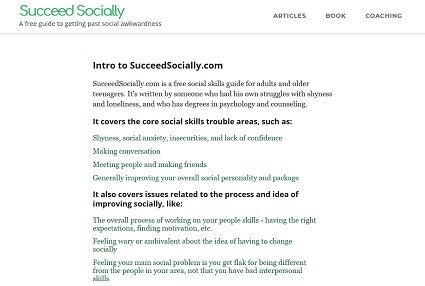 Learn new social skills and stretch your comfort zone as part of your role, e.g., having to be cheerful and talk to customers, having to make engaging chit-chat with clients, having to perform in front of people, having to initiate contact with prospects and learn to cope with rejection. Be placed in a position with some status or authority, which makes it easier to meet other people, e.g., being a bartender at a popular pub, working at a local hobby store and getting to meet people in the area who are into the same thing. People often say that travel changes you, and one way it can do that is by providing a lot of social experience, especially if you spend a lot of time in hostels meeting your fellow travelers. The situation also tends to force you to learn how to make friends quickly (fortunately most everyone you'll meet is pleasant and approachable). Traveling can also generally boost your confidence and sense of self-efficacy. If you know you have it in you to get around a country where no one speaks your language, chatting to some people at a party doesn't seem as insurmountable. Indirectly, backpacking makes you a more interesting person, because of all the unique experiences you'll have. The cliche about college is that it's a place where you can easily meet people, and start fresh if high school didn't go that great for you. You're not guaranteed to become transformed and popular the instant you step on campus, but for many people college is a turning point. Being in a position to make a lot of new friends is definitely a factor. Also important is that everyone will see you with fresh eyes, not through the layers of reputation and status you had back home. Some people also join fraternities or sororities, which you could think of as the equivalent of both joining a club and having fun roommates. Roommates are sometimes a hassle, but if you get the right ones, they can really spur your development. The best part is that having them is often like having a built-in social life. There are always people around to chat to, and your plans for each weekend are often set. If they're more socially savvy than you they may also gentle nudge you out of your shell or teach you some useful skills. For example, they may slowly encourage you to try dancing when you go out to clubs, and show you some basic moves when you're all goofing around at home. If you have a tendency to hole up in your room a little too much, they may get concerned and try to get you out more often. I got at this in a previous point. Sometimes you'll have changed quite a bit and have many of the tools in place to do better socially, but you're stuck somewhere that won't allow that to happen. You may be in a school or town where everyone has already formed an opinion of you and aren't willing to give you a chance. You can evolve and act differently all you want, but you'll still be the same old weird, unpopular person to them. You could also live in a spot where there just aren't enough of your type of people around. Some people were in a rut in one place, but once they moved away they quickly found a good group of friends and a better life overall. They could also use the new social skills and personality traits they'd developed back home without running into the barrier of, "Why is this guy trying to act differently all of the sudden? Everyone knows he's a dork. What's he trying to prove?" You'll hear of this happening pretty often in high school, though it can occur at any age. Sometimes someone will be part of a group that isn't that great for them. When they make the decision to hang around other people, their fortunes improve. Sometimes a person's group has grown past them, and they're no longer a good fit for it, even if they're still allowed to tag along with everyone. Sometimes they're the one who has changed, and their current buddies don't appeal to them any longer. Another fairly common situation is when a person's social group doesn't even like them that much and maybe even gives them a hard time. When the person stops taking their "friend's" crap and moves to a better social circle, their lives get way better. They could move from a mean-spirited popular clique to a group who, while technically lower in status, are much nicer. Or they may be stuck with a bunch of low-level jerks, and find that a more 'popular' group of people is much more friendly and accepting of them. Just being in a relationship can teach you a lot of social and life skills and change your personality for the better. You may meet a lot of fun, likable people through your partner. Being in a relationship will likely boost your confidence, especially if it's your first. Being with someone can make you more relaxed and easygoing overall. You don't have that tension and preoccupation that can come from being unhappily single, or from never having dated anyone before. You may also be more comfortable with your life and not feel you need to compete with people or prove yourself to them. Having a girlfriend/boyfriend can elevate your status in other people's eyes and make you seem okay to hang out with. The logic is that someone must have passed some minimum personality threshold in order to find a partner. If you've never been in a relationship before, you may de-prioritize making friends since finding a partner seems so much more important. Once you've found someone, you can relax and appreciate other peoples' company.